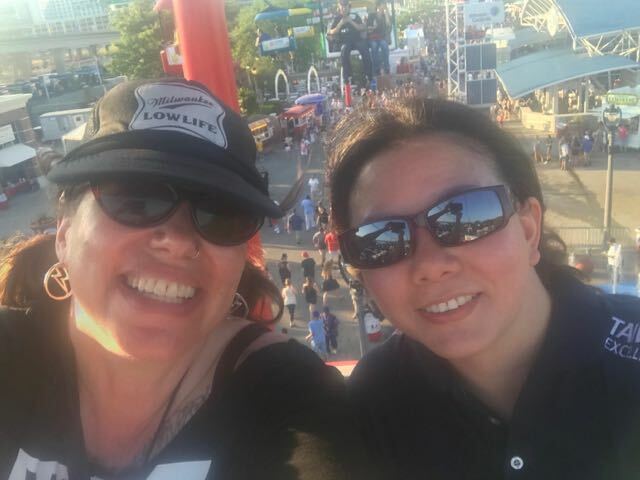 Published July 5, 2018 at 9:01 a.m.
On Friday, June 29, at shortly after noon, I boarded the Summerfest Skyglider powered by Taiwan Excellence with (squee!) Mayor Tom Barrett. He was the first of 33 riders who took a roundtrip ride with me on the Skyglider – I was more or less on the ride for 12 hours straight (you know, pee breaks) – and the Mayor and I enjoyed a mostly-political-free conversation while our feet dangled about his one-and-done singing career at the Big Gig the day before, his favorite festival eats and how Summerfest is a microcosm of Milwaukee. 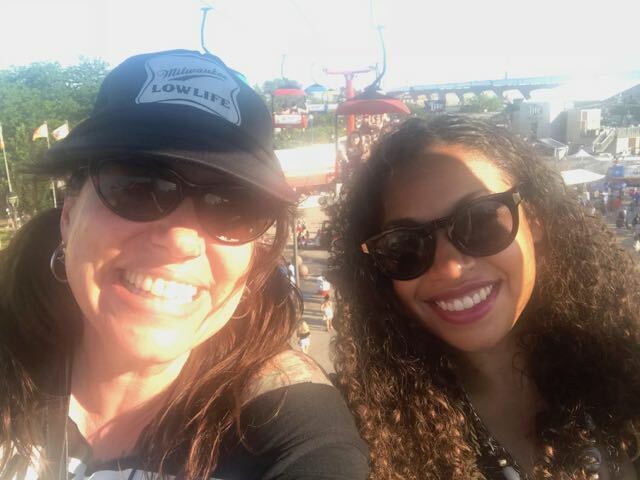 I wasn't sure the Mayor would show up for a sweaty ride in the sky – or anyone else for that matter – and I wouldn't have judged anyone for passing. 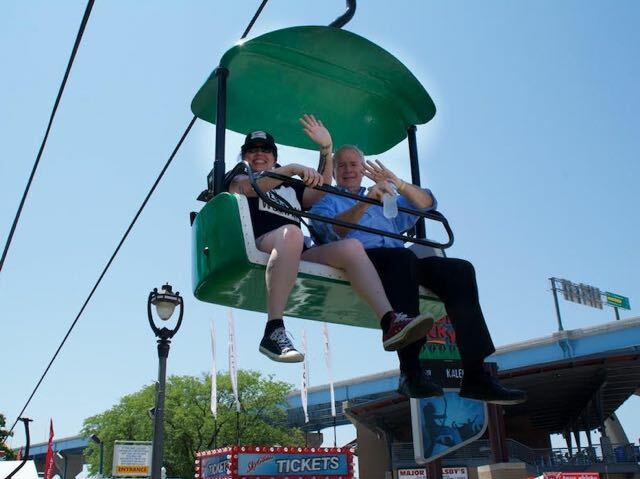 But Mayor Barrett made it – and so did everyone else. Every single person who accepted my invitation made it to the blistering black-asphalted grounds and waited, sometimes for a half-hour or more, for their chance to partake in this ridiculousness. 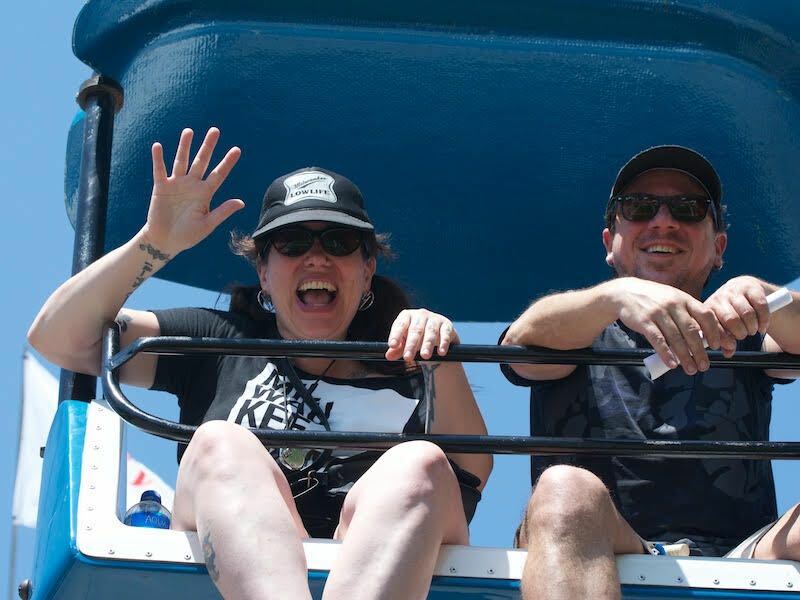 Numerous people asked me if I was doing the 12-hour sky glide ride as a fundraiser or benefit and I had thought about that. But I came to the conclusion that the reason I was doing this – if there even needed to be a reason at all – was for the sake of art, absurdity and fun. Life is so sad and serious sometimes – too much of the time – and this would be the opposite of that. Also: YOLO. 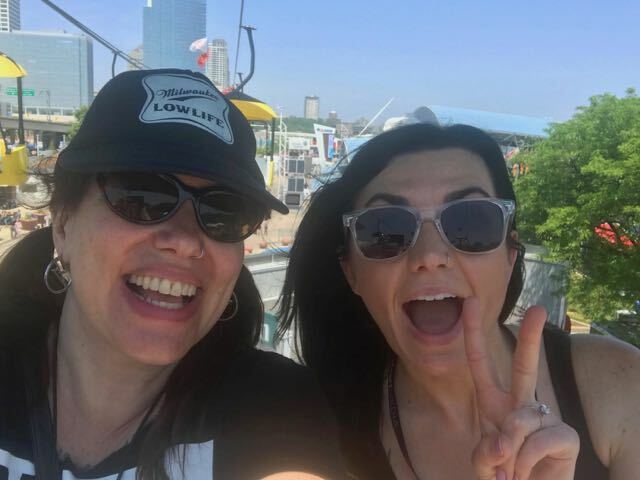 I had the desire to pull a 12-hour shift on the Skyglider for years but, a little to my surprise, found myself finally saying it out loud during an early Summerfest brainstorming meeting with the OnMilwaukee team. 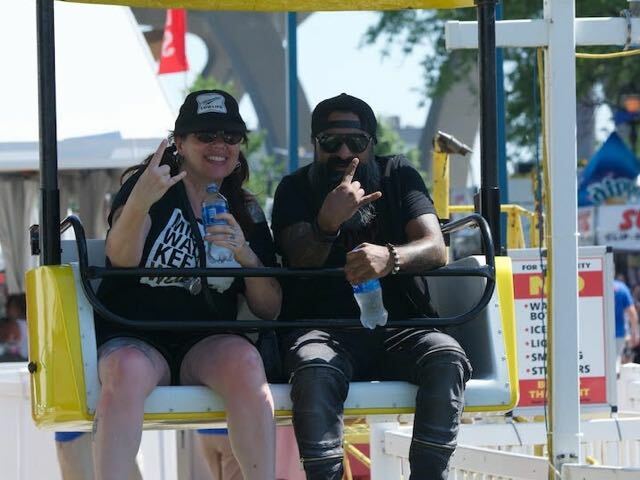 Their positive response – and later the support from Summerfest – made me quickly realize this was going to happen. I considered trying to set a Guinness Book Record – something I attempted but failed at this past winter – but knew from previous experience that I needed to apply to Guinness months earlier to get approval from the rightfully stringent organization. 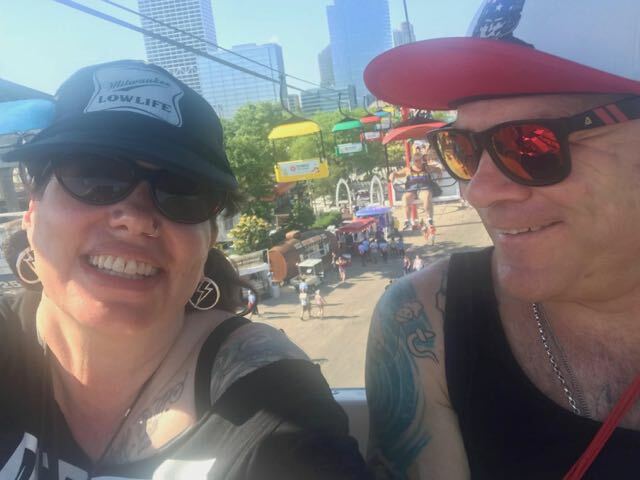 I invited about 40 Milwaukeeans to ride with me – all of whom had one thing in common: they are really into what they are into. There are so many more people I wanted to ask, but since it was "only" a 12-hour adventure, I couldn't invite everyone. The perspective one gets from being in the air is contemplative. For me (and maybe Cameron from "Ferris Bueller"), it's like looking at a Pointillist painting first as a whole and then down to the single dot. It makes me feel so important and so not important at the same time. The scents from the sky were equally as satisfying. The smell of lilacs – one of my favorite aromas in the world – mingled with the smell of grilled meats and fried food. Eventually, however, I could only sniff my sunscreen. 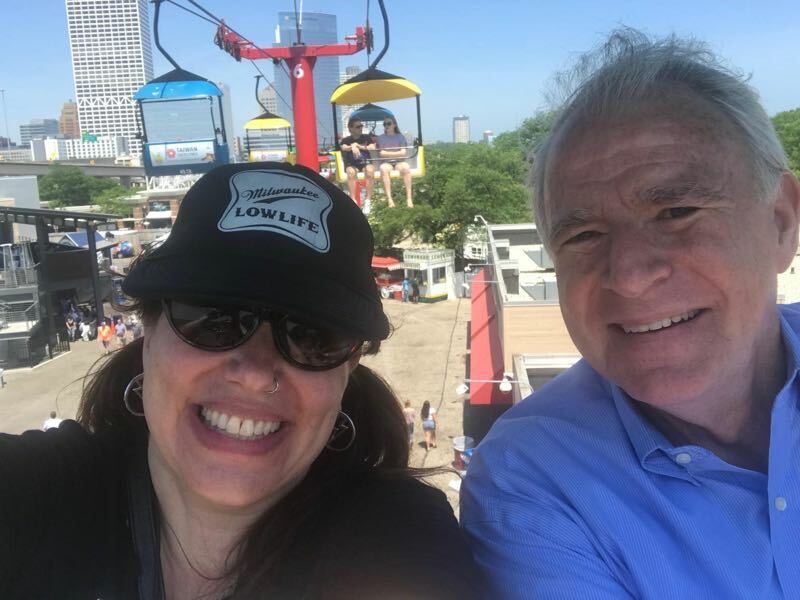 Every person who rode with me – and there were a few people who declined because, understandably, they were terrified by the skyglider – took a round-trip ride and had a different story to tell. 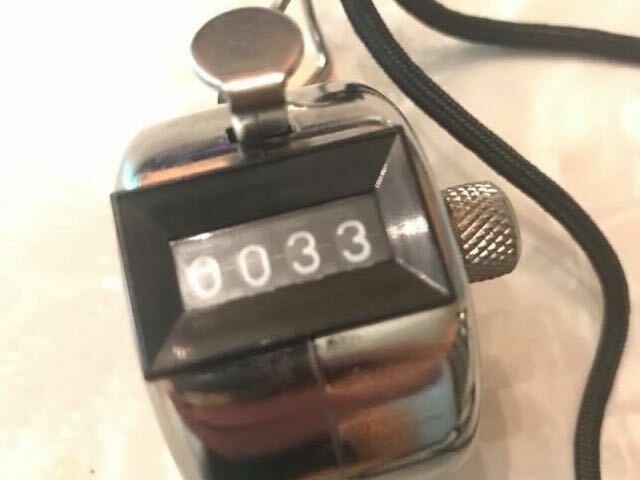 I had the gift of 33 conversations in a row. I laughed a lot. I listened a lot. Twice I almost cried. 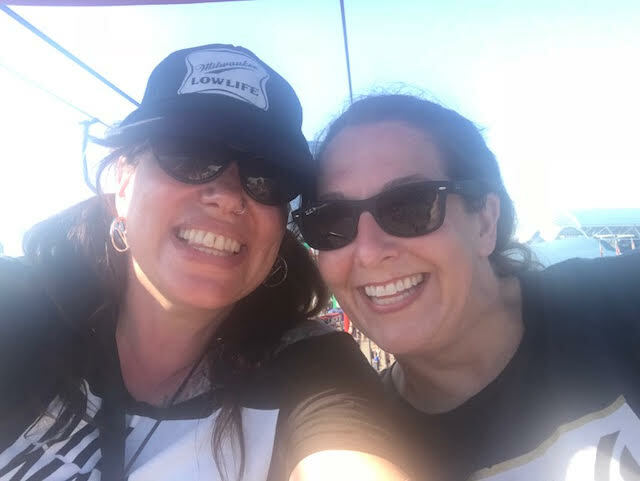 One rider received a text during our lap that a friend had tragically passed and another rider had received some bad news immediately before boarding the glider with me. But these experiences were just as meaningful to me as the motivating and happy conversations I had with so many others. 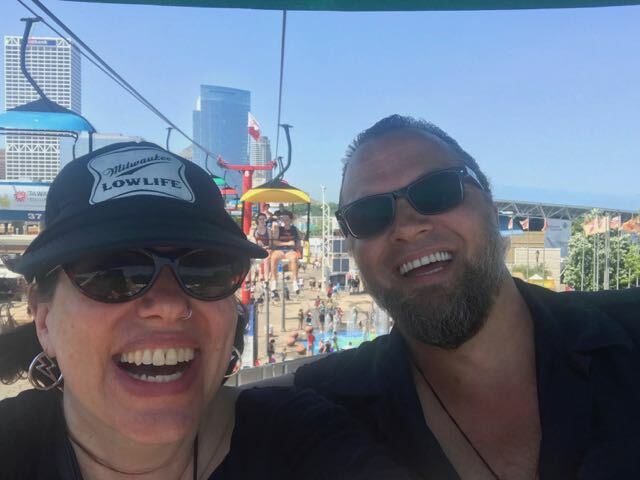 It turns out Skyglider life is just like real life: a mix of the good, the great, the bad, the ugly and, well, thanks to Friday's mean heat, the sweaty. 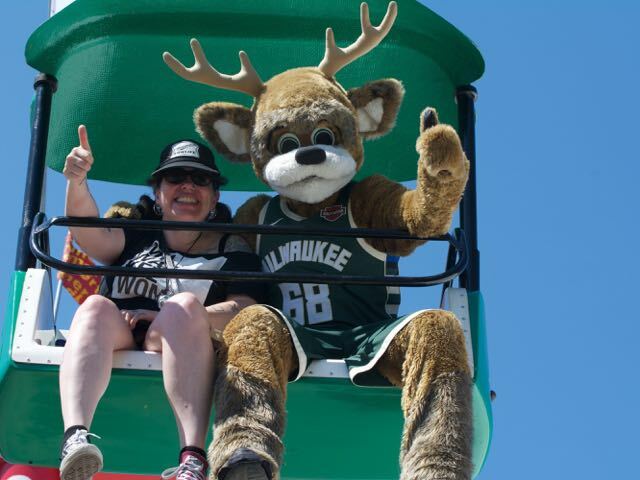 I must give 7-foot-tall props to Bucks mascot Bango – actually the energetic and obviously extremely good natured person inside the costume. Who, during his ride with me and in compliance with his role as a mascot, did not speak. I tried to get him to chat, but quickly realized he was only going to wave or give a thumbs up and occasionally squeak his nose if I asked a yes or no question. It was also, for me, a respite to refrain from conversation because 12 hours of talking is a lot of verbal communication, even for me. 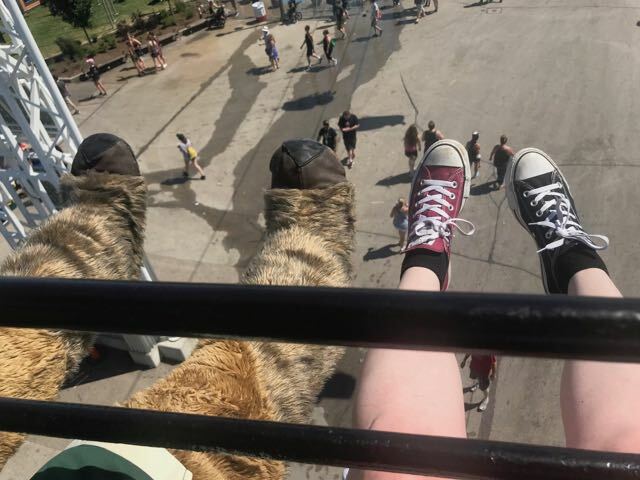 I felt compassion for Bango wearing that hairy suit in the heat, but I thoroughly enjoyed my ride with him because literally almost every person who rode toward us going the opposite direction on the glider smiled and waved at him. Especially kids, but even adults. Having car after car after car of smiling people passing you for 20 minutes (which is what an average roundtrip ride took) was one of the most uplifting experiences I've had in a while. The only downside to my 12-hour ride, other than a little sunburn, was at the very end. And in retrospect, it wasn't a downside at all. Just so incredibly hilarious and ironic I almost believe Shakespeare was right that life really is a stage. I took my final lap of the night with my partner, Royal. During the final homestretch, when we could see the end in sight and were about three minutes from deboarding, we smooched and he said "you did it, baby." And then the ride stopped. This was nothing uncommon, the glider stops often to help people get on and off smoothly, but after a few minutes we began to question the delay. 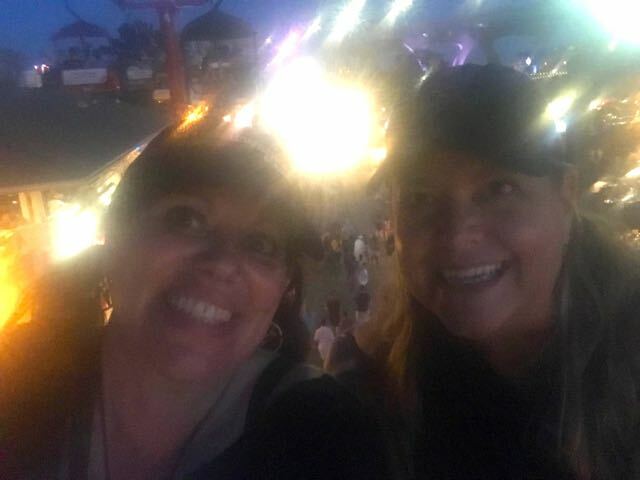 And then we saw the blinking lights of the skyglider sign in the distance go dark, and then we looked behind us and realized we were the only people left on the Skyglider. 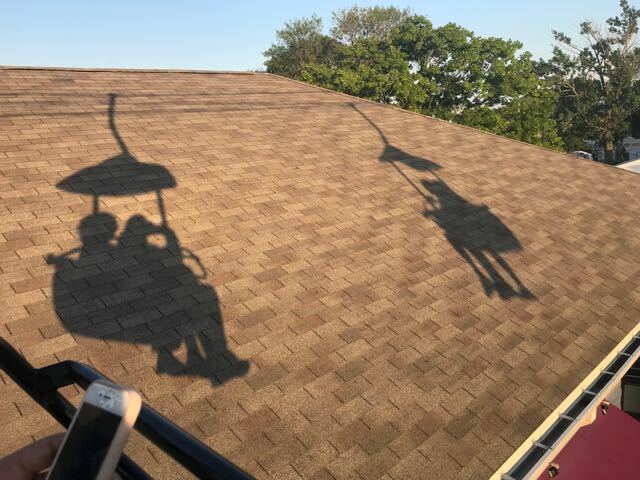 We knew we wouldn't be there for too long; I mean, we have cell phones, but the thought of staying on the Skyglider all night crossed my mind. That would definitely elevate the story. But then I remembered this thing called cold beer and how I really wanted one ASAP. 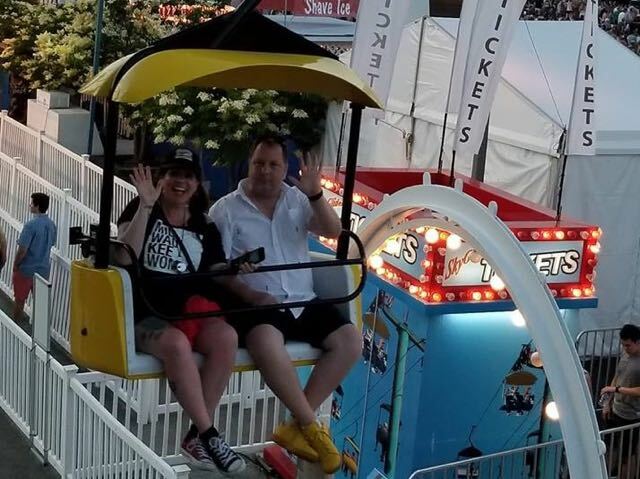 We hollered down to a couple of red shirted-security guys who then walked to the Skyglider boarding area and told the remaining workers we were still on the ride. It took another five minutes or so to get the ride going again, and when they did, it moved at about half the speed as it had all day. But finally, finally at 12:06 a.m., I was on the ground for good. The lap counter I wore around my neck said I had made 33 round trips on the skyglider during the 12-hour period. I got to take a few trips alone, too. I kinda thought I would rack up more laps, but hey, the glider is a slow-paced, relaxing activity. Something I need more of in my life on a regular basis. 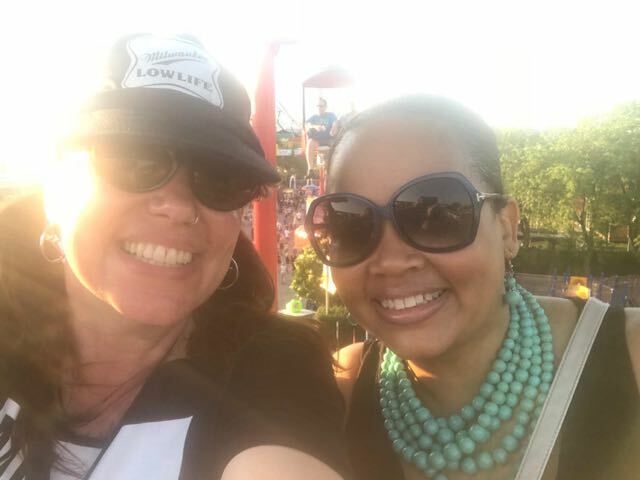 Not everyone I rode with wanted to be photographed or documented, and that's totally cool, but here are most of the brave and fun souls who cruised the Summerfest skies with me on Friday. I love all of you. 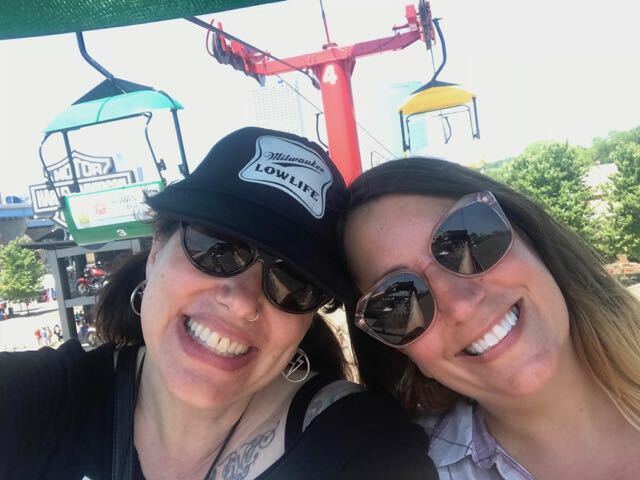 What we talked about: The similarities between Buffalo, New York, and Milwaukee and how much she digs living in Bay View. 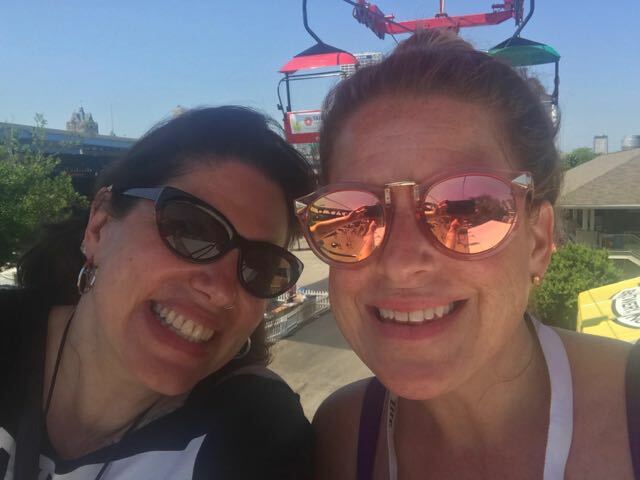 What we talked about: I honestly can't remember because whenever Dori and I hang out it is a jubilant cacophony of explosive conversation that ranges from the mundane to the extraordinary. I think we solved most of the world's problems. Or none of them. Doesn't matter because ... Dori! 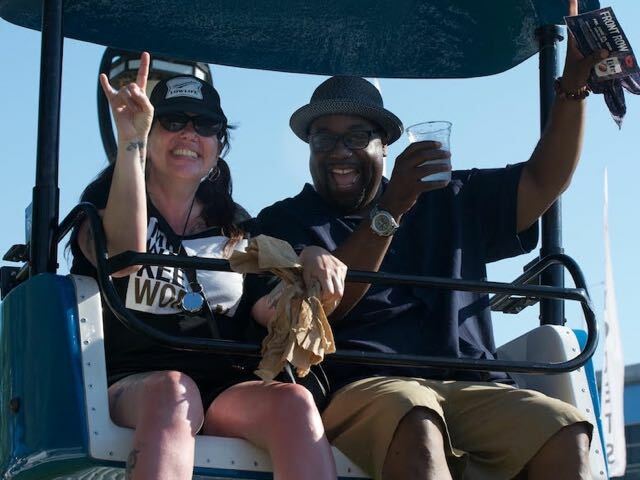 What we talked about: Jeff became my boss 18 years ago and my friend shortly thereafter. During our ride, he turned the tables and interviewed me! 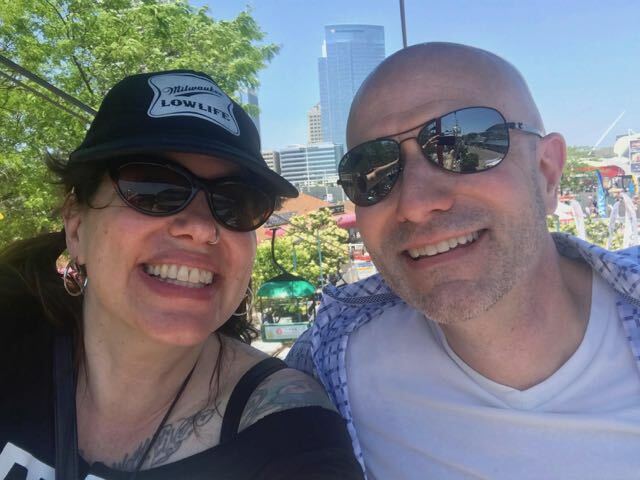 What we talked about: Kevin told me the entire story of his famous mac 'n cheese from its beginning at The Social to its place on Milwaukee menus today. I am going to write this in article form someday. Bango from the Milwaukee Bucks! What we talked about: Absolutely nothing. Bango did not say a word. He sure did wave and give the thumbs up a lot. Also: he's a great high-fiver. What we talked about: We talked about our families. Kent shared some good news about one of his six (!) kids getting a cool blacksmithing opportunity in another state. What we talked about: We talked about what we talk about every single day: work, life beyond work and work. Somehow, she gets me. 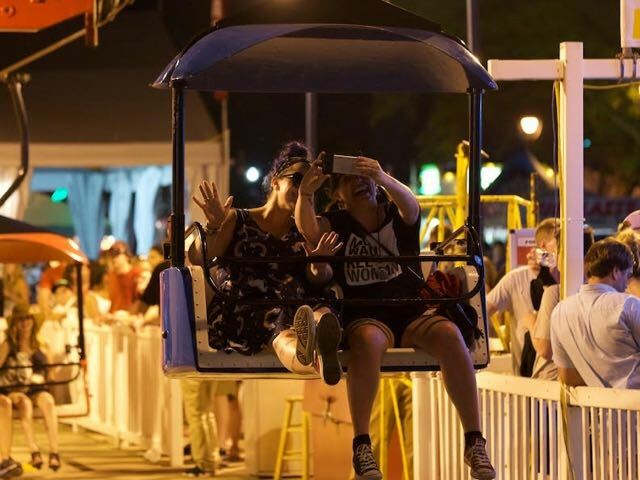 What we talked about: Selfie sticks 'n stuff. What we talked about: He asked me how I was doing. He let me be silent for a while to rest from all the talking. He also rode with me two other laps, including the final lap during which we got stranded. 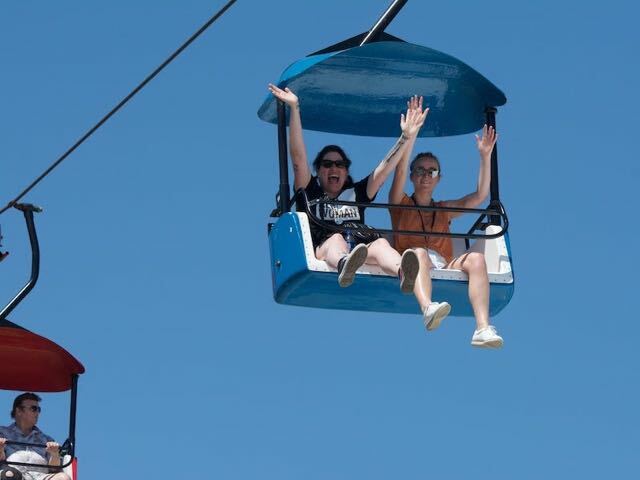 Luckily, there's no one I'd rather be stranded on the Skyglider with. 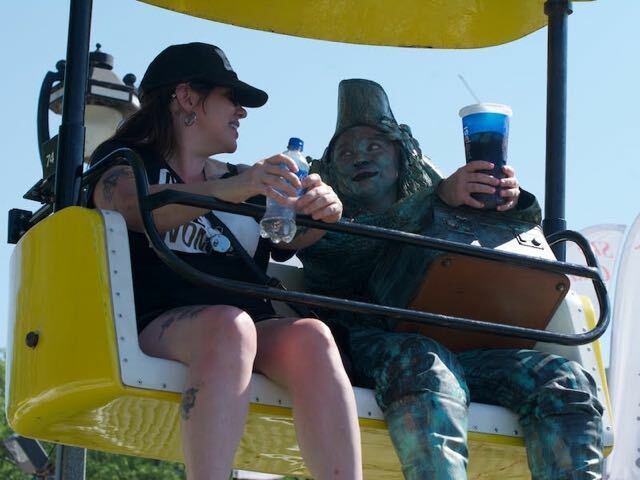 What we talked about: How in the hell does someone become a living statue? (Story coming soon on OnMilwaukee!) Also: how it was hotter than hell outside. What we talked about: Retirement! After 22 years with the MFD, Patrick retired a few months ago and is loving every minute of it. Also: Hi back there, Kelly! 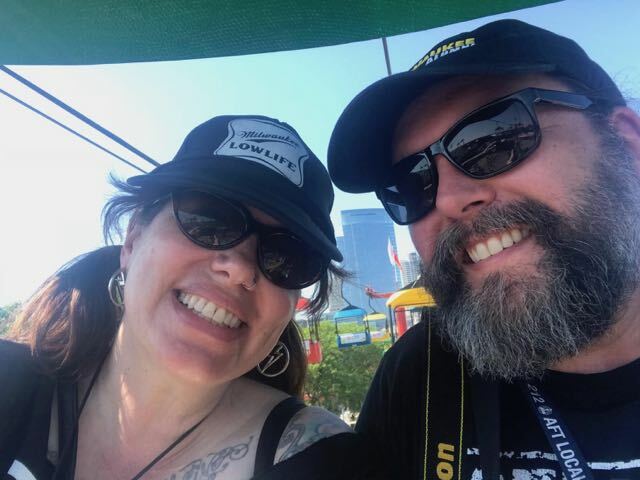 What we talked about: As a former Pfister Narrator myself, we talked about The Pfister and being the Narrator and how, no, she didn't meet President Trump last week when he stayed at the hotel. 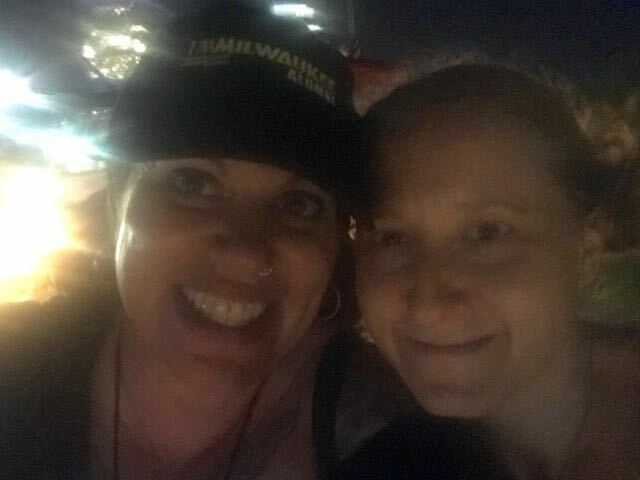 What we talked about: She told me about the 8-mile mud run she recently completed – although she showed up thinking it was only a 2-mile run. I also had the chance to tell Devon what a super awesome job she is doing as our intern. 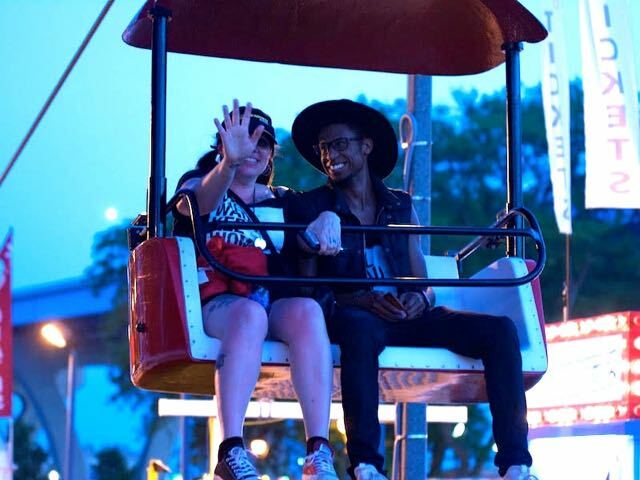 What we talked about: It was Derek's first ride on the Skyglider, so we chatted a bit about that. (He liked it, except for when it stopped in the air.) Also: what we do and why we can't / won't ever stop. What we talked about: Mia explained to me the mission of Taiwan Excellence and she invited me to Taiwan. Seriously. She invited me to Taiwan. And then I made some idiotic comment about liking Pad Thai – which is, duh, a dish from Thailand not Taiwan. 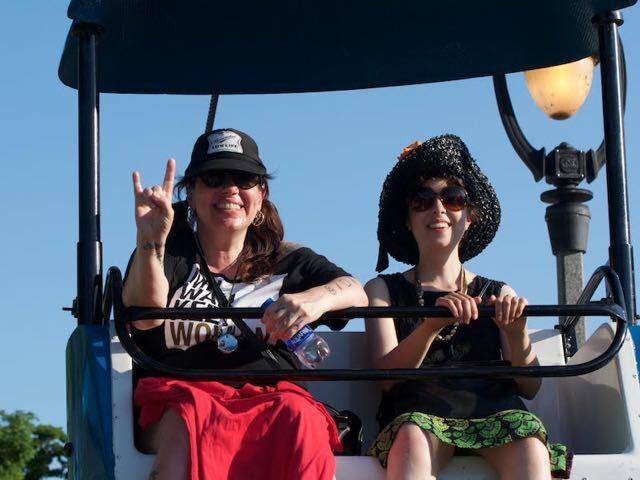 In my defense, my brain was baked (by the sun, mind you) at this point. What we talked about: Surprisingly, we talked model trains and the culture of model trains. Nick's doing some work this summer for Walthers Trains. For some reason, model trains are a reoccurring theme in my life and something I know way too much about. And of course we said "414 Let's Have One More!" What we talked about: Motorcycles, duh. She also works at Northwestern Mutual and invited me to the top floor of the new building. Oh, yeah! What we talked about: Al is my hair stylist and the owner of Taylor & Burton salon in Bay View, but we didn't talk about hair. Instead we chatted about goals to hit before we are 50 and how neither of us have any time or energy for hate. Also: his yellow shoes matched the yellow Skyglider. So perfect! 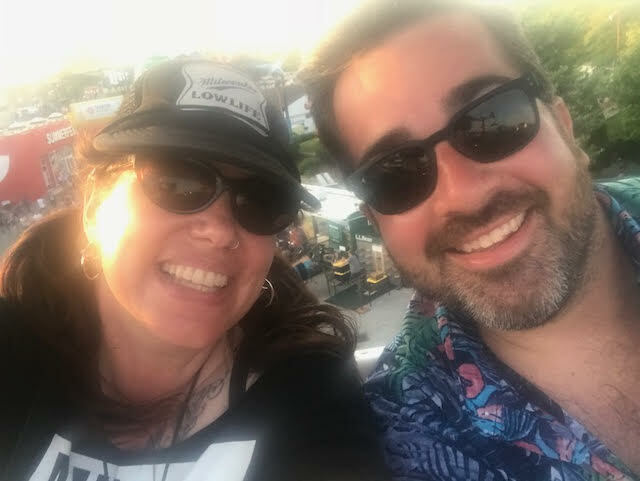 What we talked about: I know this is gonna be annoyingly vague, but my ride with Q featured the most personally and professionally inspiring convo of the day. I'm still thinking about what he said. This guy is 24 years old and amazing! He's also one of the MKE Misfits, with whom we are partnering this summer. 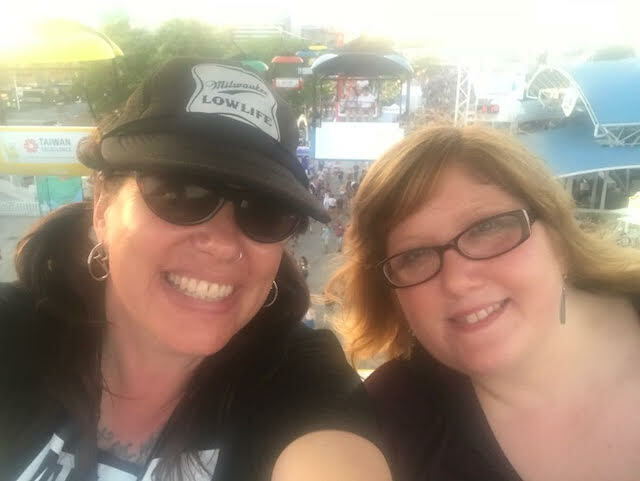 What we talked about: I've had many profound and heartfelt convos with this IRL friend, but during our lap on the glider we talked about why Kohl's Cash should be viable tender at Summerfest, who could take a worse phone-photo of the moon (which was full and incredible) and why you don't need a selfie stick for your dog. What we talked about: The full moon, of course! 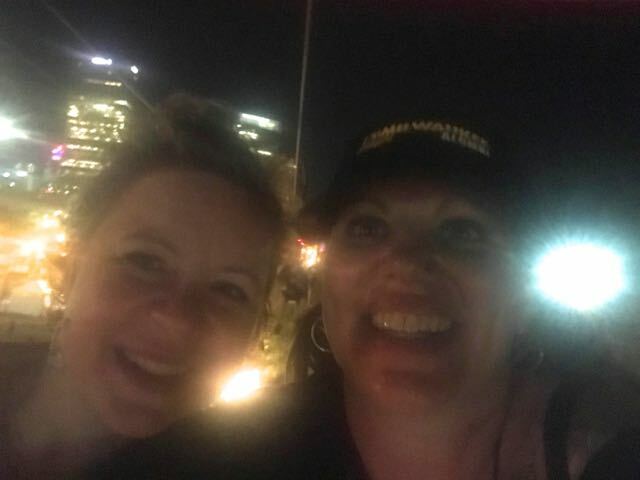 Renee and I were in a coven together for 10 years – and we've been friends for 21 years – so it was super cool to experience The Strawberry Moon with her. So mote it be! What we talked about: At this point I was completely fried and ready to go ground-side again (look at my crazy eyes! ), so I appreciated how easily Jessica chatted about her work, art and life. After the 12-hour sky gliding shift, I stopped at my local watering hole for one and then went home and had a refreshing and delicious shower beer. I am still processing the conversations of the day / night – and nursing my sunburn. But, yes, it was completely worth it.